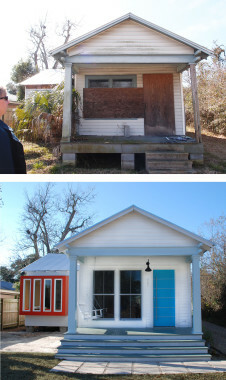 The cottage on Main Street had fallen into disrepair even before Hurricane Katrina. It was boarded up and set on top of concrete blocks, but the house still had strong bones and good details. Repairs started at the foundation, anchoring the house with chains to new foundations, and ended at the new corrugated metal roof. 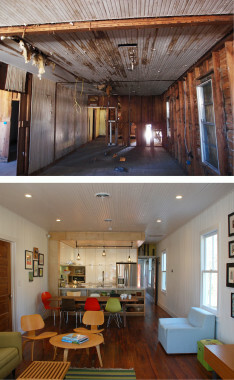 Original materials that were retained included heart pine flooring, beaded board ceilings and walls, and the cypress siding. Two new elements were added to the house: a cantilevered windowseat at the front, and a screen porch at the back. 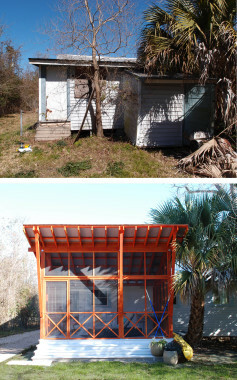 Both are set apart from the existing body of the house by their bright orange colour, and by their formal pyrotechnics. The porch creates a butterfly roof to collect rainwater adjacent to the rear garden. 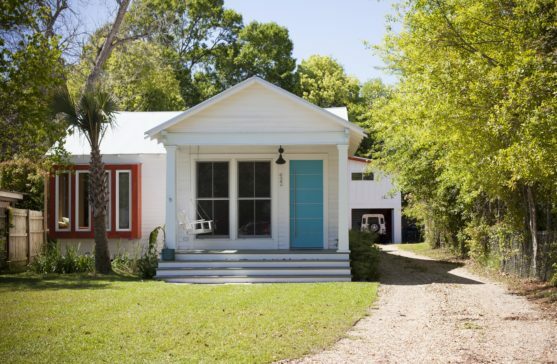 The aquamarine front door is striped with steel bands, and pivots with long pulls to welcome visitors to the unconventional restoration. Inside the house, the palette includes glossy greens and white to form a backdrop for the owners’ art collection. Original painted ceilings and doors in some rooms were sanded to expose the palimpsest of historic colours, and coated with clear sealer. The house was insulated with soy-based spray insulation, and coupled with new windows, electrical service, and a high-efficiency mechanical system, the demand for resources is minimized.